Educated in Aragonese-held Sicily, Antonello traveled to Flanders where he learnt to paint with oils and acquired a taste for meticulous detail. On his return he moved to Italy and his legacy was to prove decisive for the Venetian school. He died in 1479, that is, the same year the union between the Crown of Castille and the Crown of Aragon became effective. Can we then think that Antonello was Spanish for a few months? All manner of suggestions have been made as to the identity of this cardinal, but so far none have been accepted. Is he the cruel Rodrigo Borgia who enjoyed poisoning his adversaries? 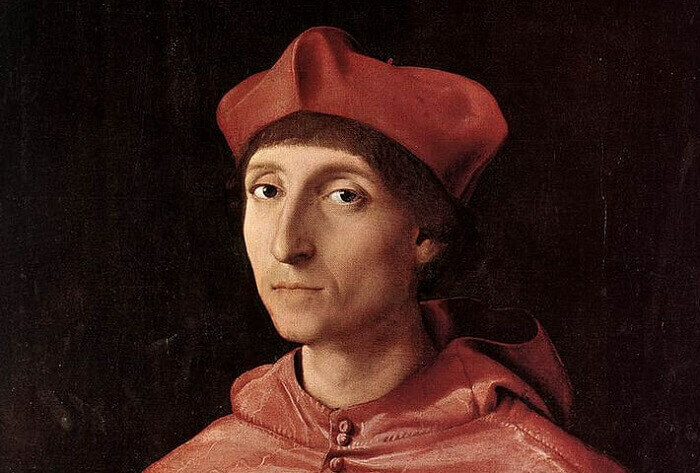 or Cardinal Dembo who wrote the most beautiful sonnets of his time? or a young Julio Medici!? This masterpiece painting of Renaissance portraiture was painted by Raphael around 1513, that is, at his most brilliant in his use of color. In 1513 Spain had already lost her queen, Isabel la Católica and in 1516 his king, Fernando el Católico. Charles of the house of Habsburg, Holy Roman Emperor of the German nation, king of Spain, México, Perú, Cuba, the Netherlands, Belgium, Austria, Sicily, Naples, etc. was the most powerful man at the time. Grandson of the Catholic kings, the German Emperor and the Queen of Burgundy. The Emperor, clad in a suit of armour, which is nowadays displayed in the Royal Palace of Madrid, rides with the river Elba in the background, ready to do battle. The protestant heresy was spreading fast throughout northern Europe and threatened to plunge Germany into civil war. The protestant forces where defeated in Mühlberg and most of their leaders captured. 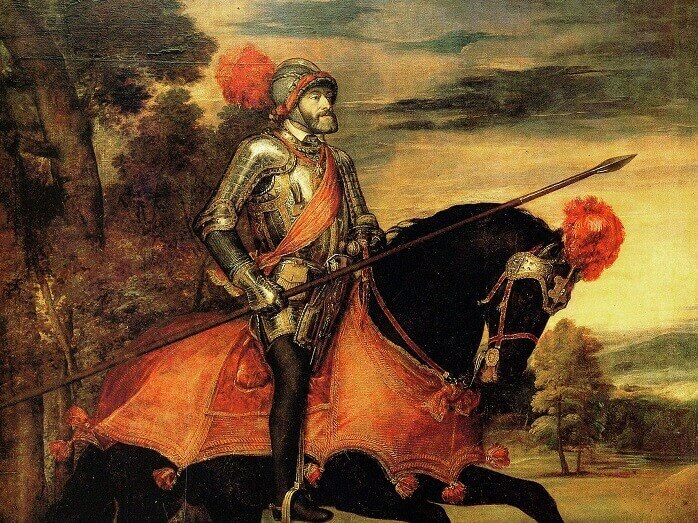 It was a great victory immortalized by Charles’ favorite painter, Titian. 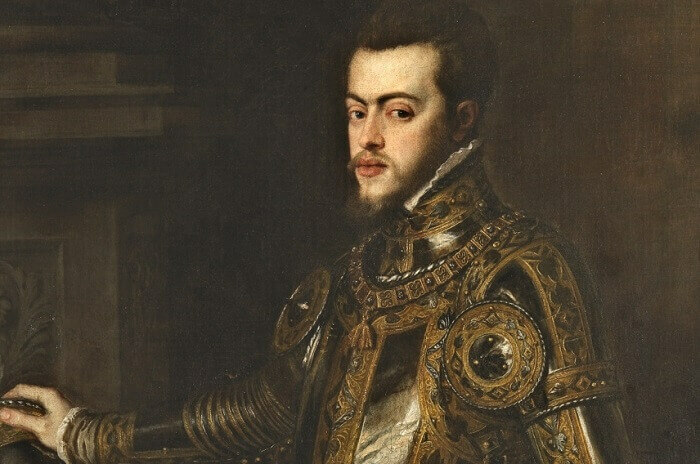 Son of the Emperor Charles V and most powerful man in the world. The Philippines was named after him but he also ruled over Spain, Sicily, Naples, America, Portugal, India etc. Isabella, the granddaughter of the Emperor and favorite of his father Phillip II. 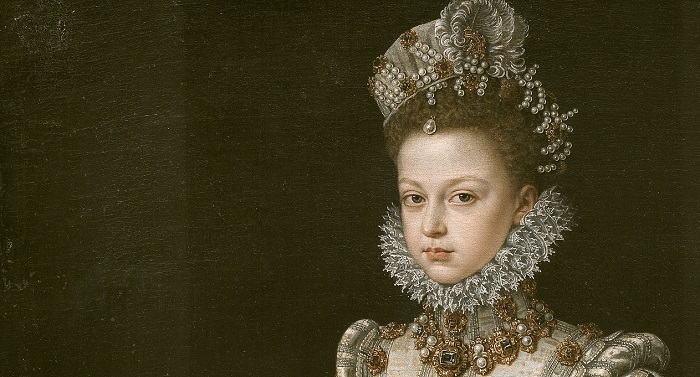 She played and important role as Governor of the Netherlands and retired, as many of the Habsburg women, by entering Las Descalzas, a 16th century convent that is still standing and visitable in the city center of madrid. The painter, Sanchez Coello, shows extremely realistic treatment of the costume (Flanders school) and profound knowledge of the warmth of the Venetian masters. Vulcan in his forge, crafting a suit of armour. The forging is interrupted by Apollo an his news of Vulcan’s wife Venus infidelity with Mars. 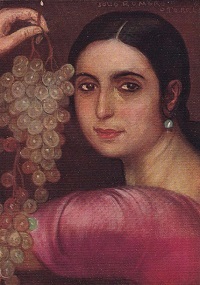 It was painted by Spanish greatest painter, Velazquez, during his trip to Italy. The influence of the school of Bologna is in the composition and the extremely careful rendering of the anatomy of the figures. Appreciate his highly personal range of greys and browns, and the lengths that velazquez goes to capture not to mention the light around and between each of the figures. The protestant heresy that swept northern Europe in the 16th century also affected the Netherlands. The Habsburg empire made of different nationalities only united by Catholicism couldn’t allow Protestatism to flourish. In the case of the Netherlands it provoked a war that lasted 80 years. Velazquez‘s masterpiece is an ode to his friend Ambrogio Spinola and how graciously he accepted the surrender of the Dutch army that so fiercely had defended the city of Breda. 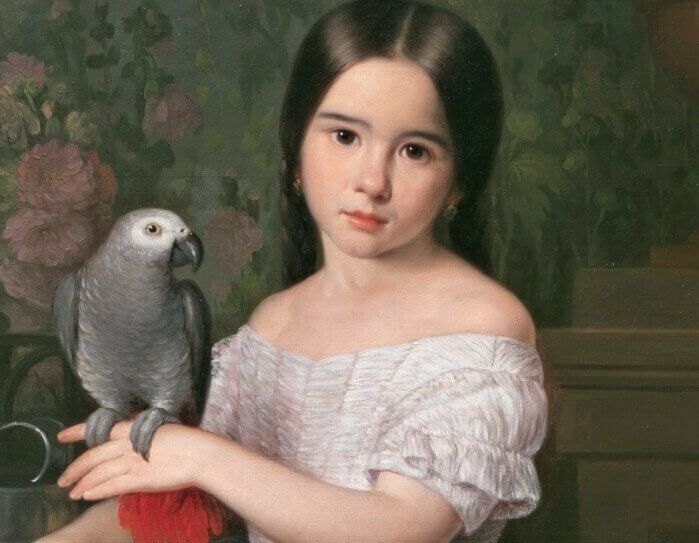 Best painting in the Prado Museum of Madrid and for many art critics the best in the world. Velazquez somehow paints not what he is seeing but was the king is. 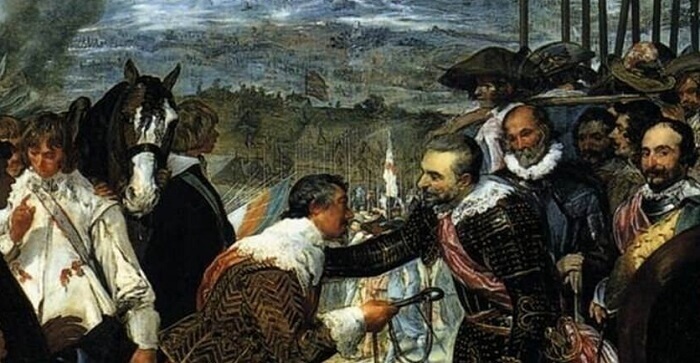 You can see the reflection of the king accompanied by the queen at the back of the painting. The volume and light of the painting are out of this world. Velazquez shows a red cross on his chest. This cross distinguishes the Knights of Santiago, an exclusive club to which modest families like Velazquez’s did not have access to. The King had to fight for over a year and it was only with the help of the Pope himself! 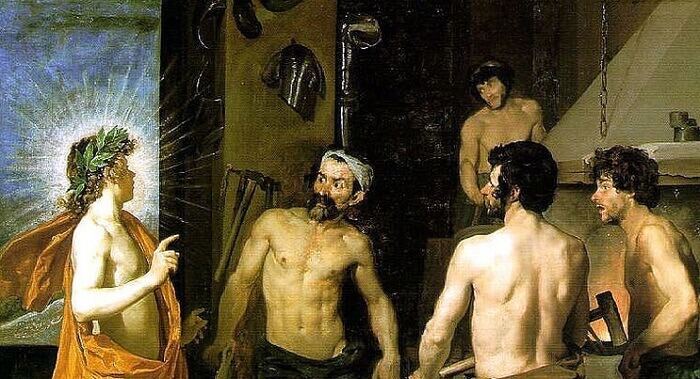 that Velazquez was knighted in the Corpus Christi convent, which is still standing in the city center of Madrid. It is extraordinary the influence of Velazquez in Goya. This 18th century Spanish genius not only copies the idea of appearing in the painting but you will also notice that he reproduces in the queen the princess’ posture of “Las Meninas”. 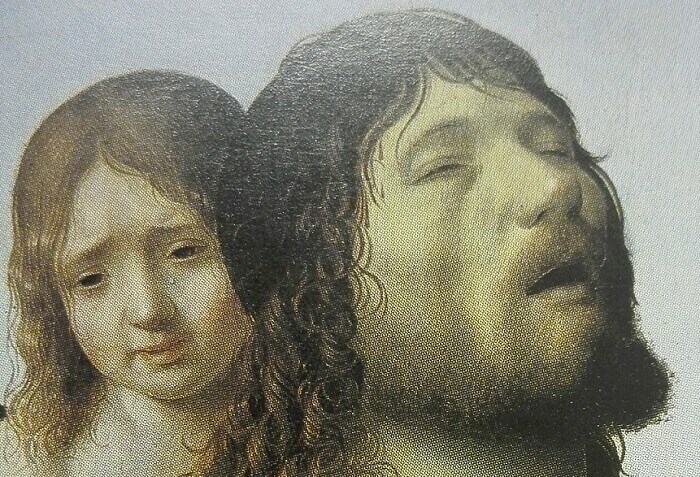 This makes sense when you know that Goya honed his technique by copying Velazquez’s paintings. 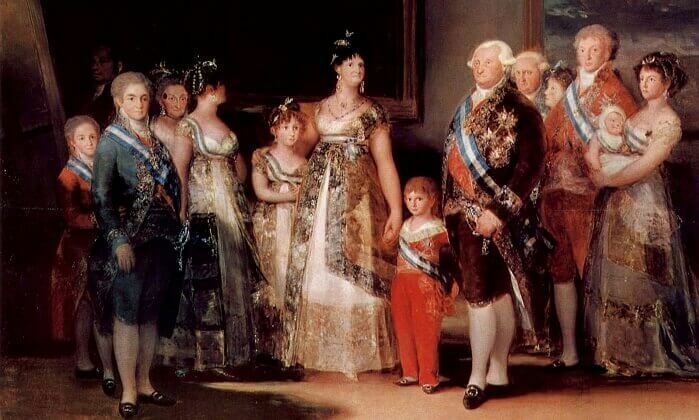 Goya was able to churn out paintings of a extraordinary quality. One of his tricks was only painting the hands of the most important people and hiding the rest. Hands are very time consuming to paint and do not add anything to the painting because you do not notice them!